The Spider Jewelry is hand made and one of a kind. 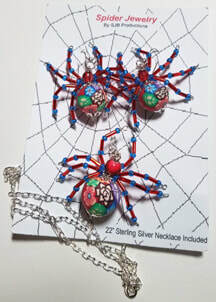 The Spider Jewelry Sets are available in Red, Blue, Pink, Purple and Yellow. The Spider Pendant is approximately 2 inches x 2 inches. The Earrings are approximately 1 1/2 inch across. The legs are made of wire and can be bent or flattened.